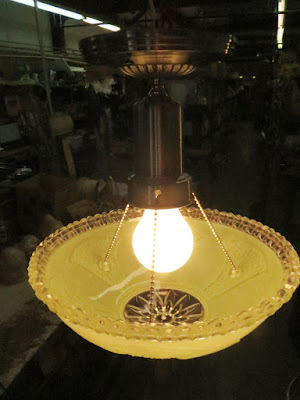 Most of this blog is dedicated to lamp repair but we can spend time appreciating styles and design in vintage and antique lighting. From pan light to pole light, there is no shortage of styles and some past the test of time better than others. Most of our repairs involve the switch, plug, or cord set. Often the lamp has a broken glass shade or glass body. As with any rule, there is an exception and for lighting repair that exception comes from the 3 Hole Ceiling Light Fixture. The 3 Hole Ceiling Fixture is one of the simplest designs for ceiling lighting with maximum decoration. Hundreds of styles were made with different patterns and colors. Some shades are frosted and others are painted. Most 3 Hole panel shades have sections of clear glass for dramatic effect when the light shows through. They all connected to the fixture the same way: three holes in the glass for a beaded chain. An advantage of the 3 Hole Ceiling Fixture is the short parts list: canopy, neck, socket, holder, wires, crossbar, screws, beaded chain, and shade. Fewer parts means less room for error or for things to get broken. Also the shades are usually made from really thick and heavy glass. They are manufactured by either spinning or pressing the molten glass in a mold. Spun glass will have a smooth inside and pressed glass might have some textured glass on the inside of the shade. The history of the beaded chain fixture is not really clear. 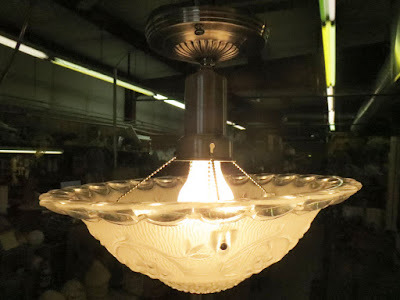 Like most designs in the lighting industry there are no brands associated with the fixtures, just a style and a design. 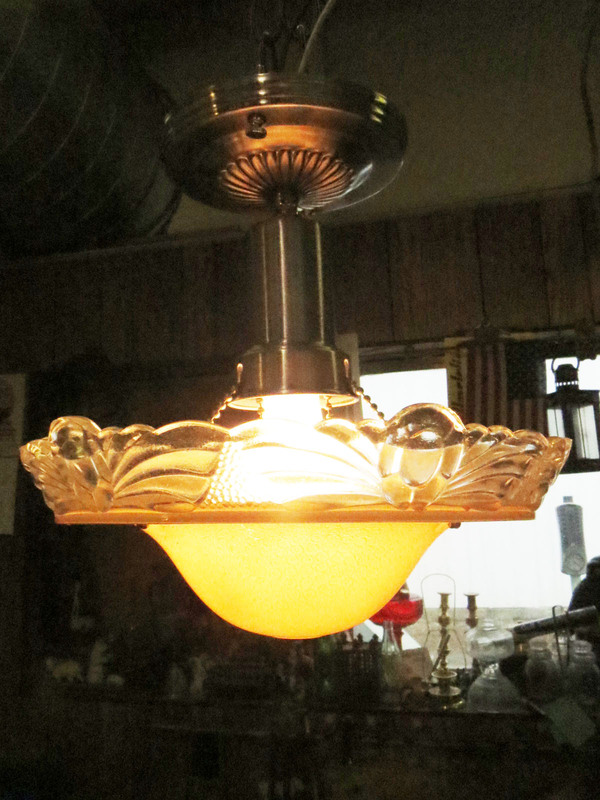 One thing is clear, these fixtures were never designed for oil, kerosene or gas lamps. That dates this style back to the early electric age of the 1920's to 1940's. With the change in consumer taste and style choices the Beaded Chain Fixture was replaced with new modern fixtures. Often the old fixture is dismantled, discarded, and in disarray but the 3 Hole Fixture was the exception. The glass shade was removed intact. Most likely made it's way to the garage, attic or yard sale stack. Beaded chain fixtures can be purchased from a lighting store without the glass. A quick search on eBay turned up over 300 shades for the 3 Hole Ceiling Fixture with prices ranging from $7 to $185. Next time you are looking for an authentic vintage lighting solution and would like to keep the costs in check, the 3 Hole Ceiling Fixture is a definite contender.